MyOra is a free SQL Tool for Oracle database developers and DBAs. This tool is simple, fast and easy to use, requires no installation, no Oracle client and no internet connection. Just download, unzip and start using with a click of the mouse, run SQL queries and Monitor database performance in Real Time. MyOra's MDI (Multi Document Interface) framework handles multiple sub-windows opened at same time. Allows multiple connections to the same database or different database. Users can open any number of Performance Monitors, SQL Editors, Schema Explorers, Session Managers etc and view them vertically or horizontally. 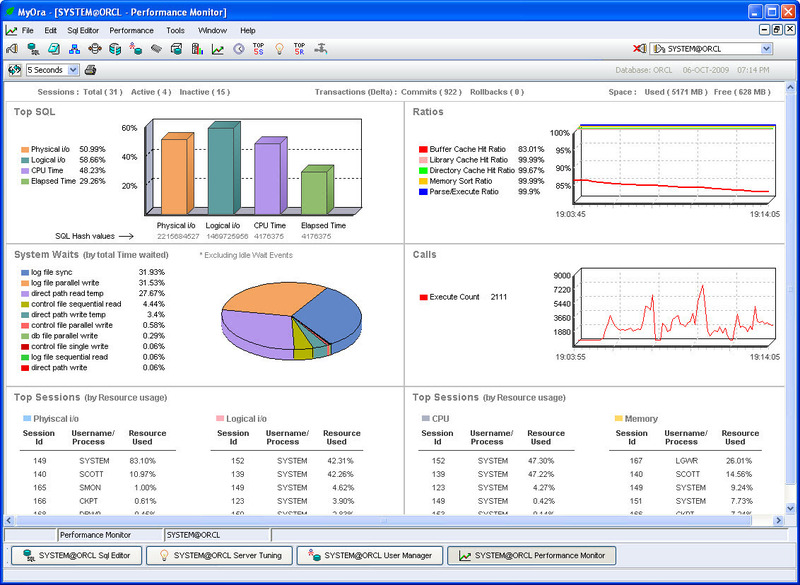 Real Time Performance Monitoring using graphs, bar charts and pie charts. Top 5 SQLs (SQL details and Explain Plan) using interactive 3-D bar charts. Top 5 Resources (Sessions Statistics) using interactive 3-D bar charts. DB Activity in real time using Six interactive graphs. Tablespace used/free pie charts. Session Manager to monitor sessions. Multiple SQL Editors with auto complete feature for Table names and Column names and many more features. MyOra will monitor the Oracle database performance in real time to identify performance problems as they occur.